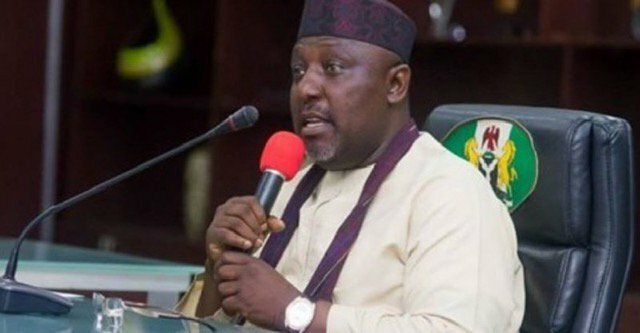 Imo State governor, Rochas Okorocha on Monday said that his embattled Deputy, Eze Madumere remains impeached until the determination of the Appeal against the High Court judgment that nullified his impeachment. 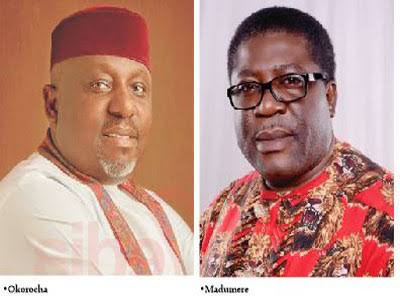 The Imo governor in a statement signed by his Chief Press Secretary, Sam Onwuemeodo, stated that, “until the appeal is decided, Madumere remains impeached. And recognizing him as the Deputy-Governor of the State with the appeal pending would mean jeopardizing the appeal”. Okorocha was reacting to a statement credited to Madumere where he lampooned the governor for not recognising him (Madumere) during a recent event in the state. According to the statement, “we have read a report in the media credited to the Former Deputy Governor of the State, Prince Eze Madumere quoting him to have said that he had appealed to Senator Osita Izunaso to forgive “Governor Rochas Okorocha’s embarrassing attitude during the mother’s funeral rites. “According to the report, what Madumere referred to as “the embarrassing attitude” of the governor was his non-recognition by the governor as the Deputy Governor of the State during the governor’s speech at the burial service of the mother of Senator Izunaso last weekend. “As a matter of fact, the failure or inability of the governor to recognize Madumere as the Deputy-Governor of the State at that event was not an oversight. That was the proper thing to do because there is an existing appeal at the Appeal Court against the High Court Judgement that quashed the impeachment of Madumere by the State House of Assembly. “So until the appeal is decided, Madumere remains impeached. And recognizing him as the Deputy-Governor of the State with the appeal pending would mean jeopardizing the appeal. He should have known this fact and if he had asked his lawyer, he would have told him that the governor acted rightly in the circumstance”. It continued that, “Madumere declared war against his benefactor or mentor (Okorocha) because he wanted to be governor, using the issue of zoning as his bet. Today, Madumere is not the governorship Candidate of any Political Party nor the deputy governorship Candidate. He has no option than to support Hope Uzodinma, the APC Candidate who is from Orlu zone. “Those who had encouraged Madumere to fight the man who made him somebody, on the ground that they would make him governor have gone their ways and the Prince is not only on his own, but now staggering, thinking about which leg to put forward first. “It is left for the Public to ask Madumere why he is still keen in working with Governor Okorocha as his deputy after he had tried in vain to paint the same man black. “To us, Madumere remains impeached as Deputy-Governor until the appeal against the Judgement of the High Court that is in his favour is decided. He has acquired maggot infested firewood and by so doing has invited Agama Lizard to both breakfast, lunch and dinner. He does not have our sympathy again”.